Tom Morello said he is willing to go into the studio and play, and that he wanted Rage Against The Machine to do far more than they did, in a recent ACLU live discussion. Morello was asked, "I understand the trials that are pick up and drop off. One other question I wanted to ask about the Atlas Underground is how you sort of conceptualize genre, because it seems like you're more of a sort of know-the-rules-and-then break-them type of guy. But I know that there are also a lot of artists who reject the whole idea of genre and don't even want to be put in any boxes. So how do you approach reaching out to rappers and folk musicians and rock stars and pop artists?" Morello responded, "Yeah. 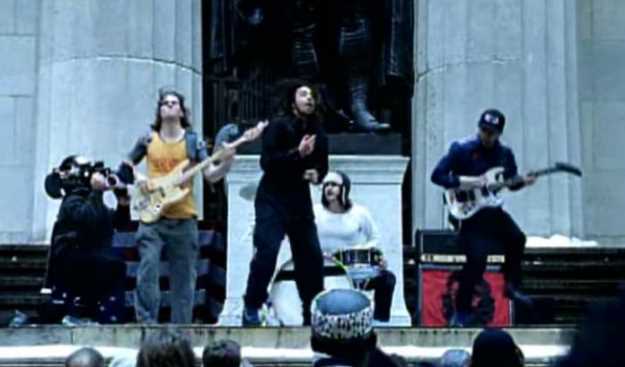 It really began when, you know, Rage Against The Machine - great band, but a band that was not particularly prolific. And we would take four or five years between records and often get long gaps in our touring. And I'm someone, like, if a studio door's open, I'm walking through it. If there's a show to be played for a cause, I'm doing it. And often, and it led me to musical interactions with a pretty wide variety - like the first two remixes I ever did were for KRS-One and the Indigo Girls. And it really made me think like, oh, there's a lot of possibilities of working with people and having artistic expression not tethered to one outlet. And through the years, you know, touring from, you know, with Billy Bragg and Steve Earle to to hip hop artists to country artists and always having a firm belief that there's no political litmus test for doing a good deed. I would do these Mayday shows in Chicago and L.A. And I would call up my friends across the political spectrum. I was like, 'We're doing this show for the unions and immigrants here. Can you sing Woody Guthrie's 'This Land Is Your Land' and shred a solo on this?' 'Yes.' And then it opens those artists' hearts and minds to a new set of ideas that they leave - not only the audience rocked - but perhaps with a different perspective."